Noah (Hebrew: נח, Nōakh; Greek: Νῶε, Nōe; Latin: Noe; Arabic: نوح, Nūḥ; "Name means::rest") (Born::Tammuz 1056 AM-fl. Flourit::Ethanim 1536 AM-Died::Tammuz 2006 AM) or Noe, according to the accounts in Genesis, the Qur'an, and the Book of Jubilees was the builder of the ark by which eight people, seven individuals of each clean animal and two individuals of each unclean animal were saved from the waters of the global flood. He was born in 1056 AM, and his name means "Relief" or "Comfort." Following the flood, he is said to have received the Noahide laws by which, according to the Jewish Talmud, all people today are bound. Noah was the son of son of::Lamech and the grandson of descendant of::Methuselah. He and his wife had three sons: father of::Japheth, Sem or father of::Shem, and father of::Ham. The order can be deduced from the Genesis record: Noah was Age of parenthood::500 years old when the first son, Japheth, was born and 600 when the Flood came. Shem had his son, Arphaxad, 2 years after the Flood, when he was 100 years old, making him 2 years younger than Japheth. Ham is stated to be the youngest. (See Sons of Noah for further discussion). Noah's wife is not named in the western canon of the Bible. According to the Book of Jubilees (canonical in the Ethiopian Orthodox Tewahedo Church) her name was Emzara. Still other ancient Hebrew sources assert that Noah married Naamah, daughter of Lamech the Murderer, or another Naamah, alleged to be a daughter of Enoch. But the Bible does not so attest. Because all other human life perished in the Flood, genetic evidence should suggest that there was a population bottleneck, and that we all trace ancestry back to Noah's family. According to mathematical models plotting genetic tracks, the most recent common ancestor can indeed be traced back around 3,000 years—not quite to estimated dates of the flood, but still far closer than evolutionary assertions of common ancestors. 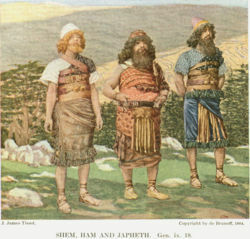 Noah's sons: Shem, Ham, and Japheth, by James Tissot. According to the book of Genesis 6:9 ,"Noah was a righteous man, blameless among the people of his time, and he walked with God". However, Noah lived at a time when men became more and more corrupt, and God determined to rid the Earth of its wicked population. Because of Noah's righteousness, God entered into a covenant with him, with a promise of deliverance from the impending Deluge. He was accordingly commanded to build an ark to save himself and his family. 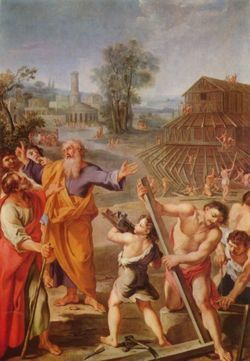 Prior to the flood, Noah preached righteousness and tried to convince the people to repent so they could avoid the wrath of God. 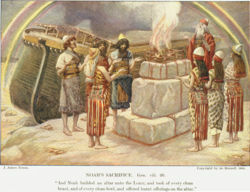 Noah's sacrifice by James Tissot. The waters rained down from above and burst out of terrestrial fissures below, flooding the earth for 150 days before the Ark came to rest in the Mountains of Ararat. All life was blotted out from the earth (the fish, though, survived in the water) and when the waters diminished, the ark came to rest on Mount Ararat (in modern-day Turkey). To test whether the waters had indeed receded, Noah first sent out a raven and then a dove to see if these birds would find something to eat. The dove returned to him the second time with an olive leaf; the third time she did not return at all, as she found a place to build her nest. After a year of occupancy in the ark, Noah was given permission to leave it. His first act on dry land was to erect an altar (the first altar mentioned in the Bible) and offer sacrifices of thanks and praise to God. God entered into a covenant with Noah—the first covenant between God and man—granting him possession of the earth by a new and special charter, which remains in force to the present time. As a sign and witness of this covenant, the rainbow was adopted and set apart by God as a sure pledge that the earth would never again be destroyed by a flood. Genesis 9:20-27 relates that Noah planted a grapevine and, in the first mention of alcohol in the Bible, we are told that Noah drank of the wine, became drunk and uncovered himself inside his tent. Ham "saw his father's nakedness" (opinions differ on just what this means) and told his brothers about it. Ham's older brothers, Japheth and Shem, covered Noah's body with a garment, respectfully walking backwards and turning their faces. When he awoke, Noah cursed Canaan, the young son of Ham, and all his descendants. Noah lived for 350 years after the great flood of 1656 AM. During this time he had other sons and daughters. 106 years after the flood (when Noah was 706), the incident known as the Tower of Babel took place (in the year 1762 AM). Noah lived a further 244 years following the great dispersion, to be 950 old. ↑ Emanuel, Janet Retting. "'Most recent common ancestor' of all living humans surprisingly recent." EurekAlert, September 29, 2004. Accessed December 24, 2007. Genesis 6:9-22 The Biblical story of Noah. Noah's Three Sons. online book by Arthur C. Custance. This page was last modified on 25 July 2016, at 19:17.